lately i’ve been re-focusing on my health. when we were in europe i didn’t worry too much about what i was eating, i wanted to be present in the experience, enjoy the local foods, forget for a minute that i have crohn’s disease and feel totally normal. which was brilliant, while we were there. but when we came home i had a hard time transitioning back to eating really clean, so the new less-healthy habits i picked up on vacation started to infiltrate my regular life. but i payed the price- i didn’t feel that great for a big part of october and towards the end i decided that i needed to do a cleanse and give myself a fresh start. for the first week i started every day with a green juice, ate enough raw veggies and fruit to keep me going through lunch and finished with another juice around late afternoon. almost immediately i saw my health improve dramatically. (have you seen fat, sick and nearly dead? it’s amazing and you can watch it for free here). so, i kept it up for another week- doing three and a half days of just fresh juice in the middle. this is my third week and i’m enjoying lots of fresh juice, veggies and fruits. i’m also starting to slowly incorporate other things into my diet so that by the end of this weekend i’ll be done cutting out foods and back to my normal, healthy eating! at the beginning of the cleanse i also started drinking a glass of warm water with half a lemon squeezed in it first thing every morning. it’s supposed to help flush toxins out of your system. whether it works or not i have no idea, but the routine of it and the intention behind it are good enough for me! and i will definitely keep both the lemon water and the green juice breakfast as part of my daily life even after i’ve finished the cleanse. it’s so helpful to start the day off with really healthy intentions, it makes it so easier to make good decisions later in the day. so tell me, do you have any new healthy habits i should know about?! Fat, Sick and Nearly Dead is amazing! Went out and bought the Jack Lelanne juicer the next day. I used it almost daily! You should post some of your juice recipes! The more good you put in your body, the less you want the other "stuff". Awesome that you incorporated warm lemon water in the morning too. It truly helps the brain and body wake up while flushing out the toxins. I also recently started drinking warm water with lemon in the morning. I feel the same way about the routine and intention of it! I always love drinking green juices in the warmer months, but winters in Maine seem to have me craving something warmer. You've definitely inspired me, however, to keep up this healthy habit even when it's cold outside! I agree with the above commenter about juice vs. whole fruit/veggies. It's better to have the whole fruit or vegetable because of the fiber; you lose a lot of it when you only drink juice. and the fiber (both soluble and insoluble) is what keeps everything "moving" so to speak. also, the skins are super packed with nutrients. I'm really trying to get into the habit of doing the same – lemon water and green juice in the morning. Starting my day with something healthy really does set the tone and helps me make other healthy decisions throughout the day. 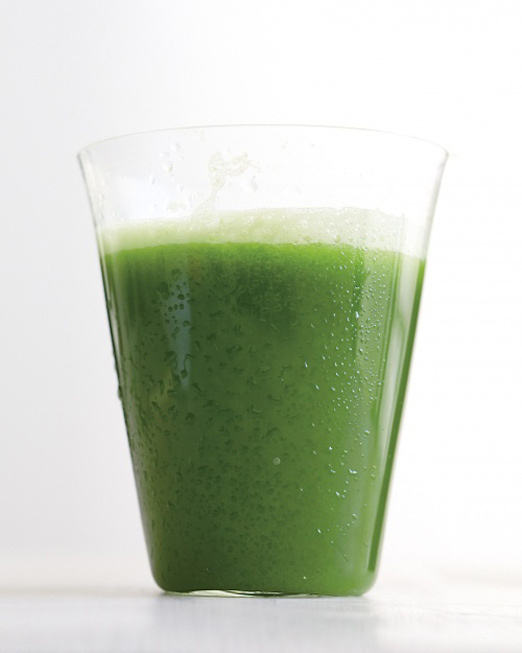 If I don't make green juice first thing in the morning, chances are even though I say I'll do it later on, I won't. What I struggle with is sometimes having the mindset that I don't have the time, but what I've found helps is washing enough veggies at a time for 2-3 days of juicing. I also just started trying out a checklist on my iphone (the Habit Factor app) which I'm crossing my fingers will also help! I really want to start incorporating a green juice every day, I think is a fantastic way to get some good nutrients fast and easy! (I have a terrible sweet tooth so I always choose the bad stuff over the good one, I know, I'm bad!) What recipe are you using? Would you mind sharing it?